Throughout August 1917, a series of strikes spread along the eastern seaboard. The initial strike involved railway workshop employees in Sydney who went out over attempts to introduce a US style card system, based on Taylorism, intended to speed up work. This first action was on 2 August. However, virtually from the very next day, strike action began to spread to an ever increasing range of industries. In NSW, the strike spread across the railways, collieries and then the wharves. Initially, it took in the full range of workers in the railways, and then miners, wharf labourers and seamen. By mid August, strike action spread to Victoria where the key workers involved were the wharf labourers and seamen. On a lesser scale, other industries and specific enterprises became involved and the unrest spread to other centres including Broken Hill. All the various actions are usually described, collectively, as the ‘Great Strike’ of 1917. The end to the NSW railway strike on 9 September is taken as the end of the Great Strike, even though some workers continued their action for some time after. For example, the Melbourne wharf workers did not vote to return until 4 December. The Great Strike of 1917 was a conflict that went beyond industrial action, as large scale as this was. It is possible to see it more as a wider working-class revolt than a series of strikes. Certainly by 1917 there was considerable disaffection in the working class. There was ‘war weariness’ but the War had also eroded real wages. Price rises had been extreme. There was also war profiteering. Above all, there was widespread concern that hard-won, pre-War industrial conditions were being eroded under the cover of patriotism. Opposition to the Yes vote in the recent conscription referendum had been strengthened by the fear that conscription was to be used to weaken organised labour. As pointed out in Post 105 even soldiers on the front line shared this concern that conscription would be used to undermine the working conditions and job security of Australian workers. The sense that the hard-won industrial conditions of the (white) working class were under attack was very strong. Another interesting feature of the Great Strike was the degree to which the traditional power brokers in organised labor – the union hierarchy and the ALP itself, as the political wing of the movement – were by-passed by more rank-and-file leadership and agitation. The organisation was entrusted to an ad hoc ‘Defence Committee’. Also, in many instances the traditional power brokers were opposed to the specifics of the industrial action. In several key instances, unions voted to strike, against the advice of the union leadership. Importantly, the industrial unrest was not restricted to just the act of striking. There were very large public demonstrations and marches – portrayed as unruly, mob-like and dangerous by the popular press – in Melbourne and Sydney. The role of women in these highly visible activities was striking. In Melbourne through August there were almost daily demonstrations in locations such as Treasury Gardens, Exhibition Gardens and Yarra Bank. Extra police were brought in from rural areas to maintain public order. To some extent, the month long strife was more an expression of the ‘direct action’ promoted by radical worker groups like the IWW than the conventional strike. Not surprisingly, the press was keen to push the claim that this radicalisation of the workers was the handiwork of the IWW and other extremist labor or socialist groups. There was speculation that the massive social dislocation in Russia could even play out in some form in Australia. Another important feature of the action was the so-called ‘black doctrine’. According to this doctrine, no unionist could work alongside a ’scab’ worker or handle or have anything to do with goods or services provided by scab labour. The speed with which this doctrine prompted other unions to strike and the way it acted as a rallying call – often against the direct advice of the union hierarchy – suggests that the ever-expanding wave of strikes represented not just specific industrial grievances but also a declaration about the fundamental beliefs of the union movement. Specifically, the focus was on the very definition of the union notion of ‘mateship’. This ties in with the argument that after 3 years of War, and ongoing attacks on the union movement, the working class itself pushed back with the equivalent of a public manifesto of what it stood for and what it would never tolerate. Ironically, the ‘black doctrine’ was arguably the main reason for the failure of the Great Strike. Essentially it meant that the strikes went too wide, too quick and too shallow. While many industries across state boundaries became involved very quickly there were important segments in these industries, and other whole sectors of the economy, where production and business continued unaffected. From the beginning, union organisers had sensed the inherent weakness of the campaign but, it appears, workers generally were not in the mood to listen to their leadership. Indeed, even when the various strikes collapsed and the workers were forced back under very punitive conditions, many workers believed, unrealistically, that they had been on the point of victory and saw the return to work as a ‘sell-out’. This sense of betrayal was heightened by the severity of the conditions surrounding their return to work; and in many cases they were never taken back. In a real sense the Hughes Government was always going to win. To begin with, after the split over conscription, the ALP was in a weak position. Further, it was clear that the union movement itself was divided over the strikes. Also, the popular press lined up behind the government. The government also had the very powerful War Precautions legislation to employ as required. Finally, Hughes set up the National Service Bureau which in effect recruited volunteers to act as strike breakers. The large number of such volunteers and the efficient organisation of the scheme were enough to break the strike. When the strikes collapsed, the workers, if they were re-employed at all, had to accept reduced conditions. In many cases their positions were taken by those who had volunteered for Hughes’ scheme of ‘national service’. The strikers were defeated and a brief period of working-class solidarity and direct action, built round idealistic notions of ‘industrial mateship’, came to a bitter end. At the same time, the victory against the strikers virtually made it inevitable that any second vote on conscription would fail. Arguments that conscription was by its very nature an attack on the working class designed to break the unions and reduce wages and working conditions – as well as open the country to cheap non-White labour – were obviously set to have more appeal. Equally, those who argued that the War was nothing but a sordid trade war were going to attract considerably more attention. For many, the War was turning into a war on the Australian working class. Industrial Australia is now engaged in the greatest upheaval known in the nation. Emanating from the strike of the railway men in New South Wales it has extended in the past few days to numerous industries in which labor is concerned, and present indications are that serious trouble will ensue before a settlement is effected. The Federal Government is taking a firm stand in the matter, and appears determined to fight the Unions and those who have attempted to disturb and upset railway and shipping facilities. Gradually the strike mania is being extended by the originators to centres of industry which, prior to the outbreak, had no cause for complaint, but are drawn into the trouble by the influence of their fellow workers. The Government is now receiving offers from country volunteers, and many have taken up the work in Sydney. An individual, a former sailor, walked into our offices [Yarram] yesterday and offered to go and help the Government wherever his services might be of any assistance. We believe a number of others have volunteered from this district. That this Council grant all possible assistance to the Government in the matter of providing labor during present strikes and that the [Shire] secretary be instructed to accept applications from volunteers. Alberton branch of Victorian Farmers’ Union … resolved that, in the event of it [strikes] becoming more serious, the Alberton branch pledged itself to endeavor to obtain volunteer workers to assist the Government. The paper also reported (24/8/17) when the local police constable was called to Melbourne … to do duty should trouble arise. Serious Extension of the Strike Trouble to Womerah. Ferns Declared “Black” – “Trouble never comes alone” was demonstrated at the office of a leading grazier in this district last week. The overseer was waited upon by a deputation of three at “Smoko” requesting a substantial increase in wages, or ferns would be declared “black.” The increase was at once acceded to, pending official confirmation. The official presented the objects of the deputation under threat of dismissal. The strike was of short duration, extending from forenoon “Smoko” on Friday, 17th and terminating on Saturday, 18th when at 5 p.m. the spokesman was dismissed, and one of his senior colleagues resenting such treatment left in sympathy. The dismissed agitator when last seen, was making his way toward Morwell Shire seeking ”White Ferns” and “Pastures New.” We are pleased to state that the strike is ended, as it was causing much concern amongst local employers. The call for volunteer labor was quickly answered by one recruit, who has accepted the agitator’s place without the right of spokesman. Presumably the article is meant to be a parody – albeit a very clumsy one – of the situation in Melbourne and Sydney. Country employers know how to handle unionists. There does not have to be any workplace bargaining, the boss just gets rid of those who cause ‘trouble’. And there are plenty of other workers who will take up the positions of those dismissed. The article does at least serve to remind that organised labour was very weak in country areas. This was particularly so in areas like the Shire of Alberton, where the nature of settlement and ongoing development had meant that there was little, if any, history of organised labor. With the exception of the timber industry and state-wide industries like the railways, there was no large concentration of workers in the one economic activity or location. Instead, the stronger history of labour in the Shire was that of the struggling selector and the family-based farm. The history of selection was one characterised by the lack of capital, equipment, technology, and services, including transport. There were major environmental challenges – drought, flood, fire – and the endless struggle to ‘clear the land’. In this world, the sense of ‘labour’ was the diametric opposite to that which had grown up in the late 19C in the large urban centres of Melbourne and Sydney. In the rural setting, the focus took in, on the one hand, self-help and rugged individualism, with the family as the basic economic unit, and on the other hand a commitment to a form of agrarian communalism. Only by coming together at this second level were ‘settlers’ able to establish schools, community halls and services such as the bush nurse. Their understanding of ‘mateship’ was one of looking out for their own interests and being self-reliant but at the same time supporting the neighbouring farms in times of crisis or against common threats. Local farming families had to rely on each other to establish the necessary social, economic and even political infrastructure for the community survive. Not surprisingly, in this environment there was an inherent fear of and antagonism to the idea of ‘organised labour’ and the threat of the strike. Moreover, even when casual labour was taken on – for example, the large number of young, single, immigrant English farm workers – the nature of the work, the isolation of the workplace and the living arrangements of the workers – commonly they lived on the farmer’s property – meant that there was a completely different master-worker relationship to the one that existed in the metropolitan factory. For a more detailed analysis of prevailing attitudes to the unionisation of rural workers in the local area see Post 10. One industrial action that caused great angst in the rural community was the strike on the railways or at the ports that held up the transport and/or export of their primary produce. It was unconscionable that their livelihood could be threatened by secondary industrial action that had nothing to do with them. They saw their interests exploited by organised labour in an industrial conflict that was not of their making. The appeal in August 1917 to go tho the city and stand in as volunteer wharf labourers was a very powerful and natural call to arms in farming communities. It is also important to acknowledge that the rural communities also viewed the Great Strike as a direct threat to the War effort. As they saw it, the union movement was undermining the nation’s ability to prosecute the War. At the very least, the series of strikes was a major distraction and drag on the Hughes’ Government’s ability to proceed with its singular focus on maintaining Australia’s commitment to the Empire. At their worst, according to the official narrative, the strikes were intended to cripple the Hughes’ Government and pull Australia out of the War. The strikes were overlaid with accusations of treachery, if not treason. The hand of the mythically powerful and omnipresent Industrial Workers of the World (IWW) was said to be behind it all. For its part, the Government was keen to retaliate by employing the considerable force of the War Precautions Act to defeat the strikes. Even though they have faded from the nation’s memory, the events of August 1917 in Australia were highly significant at the time. The speed with which the strikes spread and the number of industries affected caused considerable anxiety. With only limited support from the union hierarchy – and even less from the demoralised and broken ALP – the workers themselves fashioned the strikes into the radical defence of their hard-won conditions and the commitment to fundamental union principles and values. The strikes were symptomatic of deep and divisive concerns about the true cost of the War and the future of the working class. The strikes became an expression of class solidarity and class conflict. But the strikes were also destined to fail and the Hughes Government was keen to settle scores. For all these reasons the “Great Strike’ of August 1917 was a unique chapter in our history. And at the time, the events of August virtually guaranteed that any second referendum on conscription would be defeated. As the workers saw it, the impact of the War was now being carried disproportionately by the urban working class. This entry was posted in Conscription, Divided Community, July to December 1917, The narrative of the War, The rural working class on August 25, 2017 by pcashen. Two ‘locals’ – Gordon Martin and William Edward Babington – were killed in action on 8 June 1917 at Messines. The fighting at Messines was heralded by the detonation of 19 mines under the opposing German lines. The German troops were demoralised and many surrendered. The allied troops were able to secure their objectives. Messines also saw the more accurate and effective use of artillery. The ‘creeping’ barrage was used to significant effect, although there were still casualties when the advancing troops went forward too quickly. A large number of British tanks were employed and there was more effective targeting of enemy positions, thanks in part to better maps and improved observation techniques. Overall, the military operation was judged ‘successful’. Messiness has been heralded as a classic illustration of what could be achieved on the Western Front when an operation was well planned by competent leaders [The planning by Monash, in charge of 3 Division, was said to be exemplary] and the infantry were asked to advance no further than the distance covered by their own artillery. … It should also be remembered that Messiness [7-14 June] cost 26,000 British casualties, of whom almost 14,000 were from II Anzac Corps, many of them victims of gas. One of the 2 local men – Martin – was from 39 Battalion and the war diary for this battalion described how the men were subjected to heavy gas shelling even before they reached the assembly trenches for the attack. They had to move through Ploegsteert Wood where the gas was incredibly thick. Using their box respirators they struggled though the heavy gas in the dark. According to the account in the Offical History (Vol 4, Chapt XV) many officers collapsed from the effort involved in keeping the men moving. The total number of casualties for 39 Battalion, to the point when they were relieved early in the morning of 9/6/17, was approximately 470. There were comparatively few deaths, but 300 were wounded and another 145 were missing. The other local man – Babington – was from 37 Battalion and the overall casualty level was similar. The casualties, to the point the battalion was relieved – 11 am on 9/6/17 – were 492. In this instance there were 67 deaths, 331 men were wounded and only a handful of men missing. For the AIF, ‘victory’ at such a cost was unsustainable, particularly given the very low recruiting numbers back home. Gordon Martin was a volunteer whose military service was not remembered in the local area. His name does not appear on any memorial in the Shire of Alberton. Yet he definitely enlisted from Yarram. He had his initial medical in Yarram with Dr Crooks on 28/1/16. A railway warrant (#260) for travel to Melbourne to complete the enlistment process was issued in his name by the Shire Secretary on the same date. The address that appeared on the embarkation roll was Barry’s Hotel, Alberton. The occupation given was ‘operating porter’, suggesting that he was employed at the Alberton Railway Station. Possibly he had not been living and working in the Shire very long but the reality is that he did enlist from there. There is no evidence that he was ever given a formal farewell from the Shire. To make his life even more unknown and unrecorded, there is very little detail of his military service and the circumstances of his death. There is no Red Cross file for him and his family did not complete the information for the (National) Roll of Honour. Nor is there any correspondence in his service file to throw additional light on his life in the AIF. Gordon Martin was born in Dunolly. His enlistment was completed on 21/2/16 – nearly one moth after the medical in Yarram – and at the the time he was 22 yo and single. His religion was Church of England. His father – John E Martin of Seymour – was given as his next-of-kin. He enlisted as reinforcements for 39 Battalion. Private Martin embarked for overseas on 27/5/16 and reached the UK on 18/7/16. He joined 39 Battalion in France on 23/11/16 and was killed in action at Messiness on 8/6/17. His family was notified of the death at the start of July (2/7/17). He was buried at Strand Military Cemetery, Ploegsteert, Belgium. Personal kit – Identity Disc, 2 Note Books, Photos, Testament, Prayer Book, Fountain Pen, Scissors, Cigarette Case, Razor – was returned to the family in March 1918. As already indicated, while the casualties for 39 Battalion at Messiness were very high, relatively few men (24) were killed. Private Martin was one of them. Unlike Gordon Martin, William Babington was very well known in the local area and his name appears on many memorials: the Shire of Alberton Roll of Honor, the Alberton Shire Soldiers’ Memorial, and the honor rolls for the Yarram State School, the Presbyterian Charge and Stacey’s Bridge. William Babington was born on 22/9/1891 at Trentham. He grew up in the local area, attending Yarram State School. His father – William Dunn Babington – was a dairy farmer at Jack River where he had a 114 acre property. The son worked on the family farm and on his enlistment papers he gave his occupation as ‘dairyman’. The mother was Williamina (sic) Babington. There another brother – John Sutherland Babington – who had enlisted very early in the War (16/9/14). He was younger (20 yo) and at the time was also helping on the family farm. All his military service was in the Middle East and he returned to Australia with the rank of sergeant in July 1919. When the father completed the information for the (National) Roll of Honour he indicated that Stacey’s Bridge was the place with which his son was ‘chiefly connected’. William Babington was also closely identified with Devon, where, prior to enlisting, he had been the captain of the local football club. At the time William Babington enlisted he was 25 yo and single. His religion was Presbyterian and he appears to have been actively involved in the church as a young person. Private Babington had his first medical on 21/1/16 in Yarram with Dr Crooks – this was exactly one week before Gordon Martin’s medical – and he was re-examined in Melbourne on 16/2/16. The official date for his enlistment was 8/2/16 and he joined as reinforcements for 37 Battalion. There was a formal farewell for him and 20 other local recruits – Gordon Martin was not there – held at Yarram on 24/4/16. It was reported in the local paper – Gippsland Standard and Alberton Shire Representative – on 26/4/16. On the occasion, he and the others were told that, The charge of the Light Brigade faded into insignificance compared with the brave deeds of our Australian boys at Gallipoli. It was one of the many occasions when the farewell was used to appeal for more volunteers. The Shire medallion was handed to the men. Private Babington embarked from Melbourne on 3/6/16 and reached England on 25/7/16. There was a period of further training before he proceeded to France and joined 37 Battalion in November (22/11/16). He was promoted to lance corporal in March 1917 (5/317). On 1/11/16 the local paper published a letter written by Private Babington which covered, in detail, the voyage from Australia on the troopship Persic, and first impressions of the enormous military camp on Salisbury Plain near Amesbury. He noted of the camp, You will hardly believe that this camp is 12 miles by 13, nothing but huts as far as the eye can see. He also noted that … there are over 40,000 Australians camped here. Lance Corporal Babington was killed at Messines on 8 June 1917. One witness statement in the Red Cross file had the date of death as 7 June, the first day of the battle. There are other inconsistencies in the several witness statements but, generally, it appears that he was shot, in the chest, and died within a few minutes. Several refer to him being shot by a German sniper and as he was a lewis gunner it is highly likely that he would have been targeted. Some witnesses reported him being buried but others were unsure, and one even reported that he saw the body still in the field three days after he had been killed. Most agreed that if he had been buried, the grave would have been in Ploegsteert Wood. There is also a record of the grave being SE of Messines. However, in the end, there was no formal identification of any grave and Lace-Corporal Babington’s name is recorded on the Menin Gate Memorial, Ypres. Mr. W Babington, Stacey’s Bridge, received the sad message on Tuesday night that his son, Lance Corporal W. E. Babington, had been killed in action on 9th (sic) June, 1917, and conveying the sympathy of King and Queen and Commonwealth. Lance Corporal Babington previous to enlisting was a popular young man, a good footballer and captain of the Devon team, and worked with his father as a dairy farmer. … Lance Corporal Babington paid the supreme sacrifice for his country. The sympathy of our readers will be extended to Mr. and Mrs. Babington and family at Stacey’s Bridge in the loss of their son. The article also described how The night before the sad tidings reached his parents a letter came by mail, saying he was fighting only 200 yards from the enemy. Then on 21/9/17 the following additional article on the death of Lance Corporal Babington appeared in the local paper under the heading A Gippsland Hero. The father obviously provided the paper with the correspondence he had received from the UK. It is worth quoting the letter in full because it illustrates how the all-pervasive, background narrative of the sacrifice of the Christian soldier was so commonly applied at the time and in such a highly personal way. No matter how dreadful the loss of the son, there was a strong and comforting religious ‘explanation’ of the tragedy. Mr. Wm. Babbington (sic), Stacey’s Bridge, has received from the chaplain at the front particulars relating to his son’s death. He writes: – Dear Mr. Babington. – You have had the official word of your son’s death in action, Lance Corporal W. E. Babington, No. 228. on the 8/6/17. It was in the great battle of Messiness, that splendid victory, but won only by much sacrifice, and your fine lad was one. He was a hero. I have just been talking with O.M.S. Redd[? ], of his Company, who was beside him when he fell. It was right up to the very forefront of the attack, and your boy was fearlessly brave – was one of those who by their indomitable courage made the attack so successful. A shot from the enemy, however, got him, and he died on the spot. His comrades thought the world of him, and the O.M.S tells me it nearly knocked the heart out of him to see your boy fall. They were fine fellows, these boys of ours, good souled and fine spirited. As their chaplain I thought very much of them, their earnest interest in the real things that count. How keen they were for religious ministrations, and at services and communions they gave splendid attendance. They went into the fight well prepared, and the God above them gave them strength and courage. As He will give to you for your great sorrow. God help you is our prayer. We always pray for you all in our services. Your boy with the rest was keen on these things, yours in much sympathy. A. Irving Davidson, Presbyterian Chaplain to the Regiment. Personal kit was returned to the family in March 1918: Calabash Pipe, Folding Scissors, 2 Notebooks, Cards, photos, Letters. The contrast between the 2 men killed on the same day highlights just how significant the locals’ definition of ‘local’ could be. It also throws light on the fate of the itinerant, working-class volunteers: if a person was not tied to a particular location, his effort and ‘sacrifice’ could easily dissipate, if not disappear. This entry was posted in January to June 1917, Recruiting, Religion & Community, The dead, The rural working class on June 13, 2017 by pcashen. This post continues the analysis, in six-monthly intervals, of the essential characteristics of all those with a link to the Shire of Alberton who enlisted in WW1. The relevant previous posts in the sequence are: Post 22: Enlistments to the end of 1914: background characteristics Part 1 – movement, occupation, age and marital status, and Post 56: Enlistments in the first half of 1915: background characteristics Part 1 – movement, occupation, age and marital status. Arguably, the most significant feature of the cohort of men who enlisted between July and December 1915 was its size: 199 men and 1 woman (Alice Cocking, a bush nurse from Madalya). In the first half of 1915, the size of the equivalent cohort was 102. The dramatic increase was tied to the Anzac campaign – and the reporting of the campaign – which ran through to the end of 1915. Also, as will be covered in coming posts, the second half of 1915 saw the first, planned, large-scale recruiting drive. The nature of the enlisted men’s association with the Shire of Alberton has been covered in the earlier posts. The same features apply for this particular cohort. The mobility of the rural working class – to other locations in the same district or the wider region (Gippsland as a whole), to and from Melbourne and other regional centres, and interstate, particularly Queensland and Western Australia – is striking. Notions of ‘local’ were far more dynamic than the inherently static definition that we commonly employ in studies of ‘local history’. The table shows that 29 of the 200 men were born in the United Kingdom. When this figure is added to the equivalent numbers for the 2 earlier cohorts, the total number of UK immigrant rural workers to enlist, to the end of 1915, from the Shire of Alberton comes to 63 or 15% of the total number (436). Clearly, the local community would have been aware of this obvious trend and, presumably, given the numbers involved, it would have been very difficult for any such immigrant worker not to enlist. The expectation was that the British immigrant had an even higher responsibility to answer the Empire’s call to arms. The point was made in Post 56 that by the middle of 1915 the enlistment process required that while men could be enlisted in country areas – following an initial medical by the local doctor – and given a railway warrant to travel to Melbourne, the enlistment process would only be completed after another medical examination in Melbourne. This is apparent in the table where ‘Yarram/Melbourne’ is listed as the most common place of enlistment. Incidentally, the local doctors – Drs Pern and Rutter – were incensed by the directive and took it as an attack on their professional credibility. For a brief time they even refused to carry out the (initial) medical. The boycott, limited as it was, will be covered in a future post. Once again the cohort is made up predominantly of the rural working class. By far the 2 most common occupations given were ‘labourer’ (50) or ‘farm labourer’ (31). Others gave a more descriptive title – drover, stockman, boundary rider, shearer, sleeper hewer, saw mill hand, timber hewer, gardener, railway shunter, railway employee, railway porter, fisherman, bar man, shop assistant … – and there were some from more skilled backgrounds – lino type operator, blacksmith, carpenter, baker, butcher, cordial maker… There was also a group of teachers (7), a larger group of clerical staff (13 ) and a very small number of professionals including Rev George Cox, the local Church of England minister and Dr Horace Pern, one of the 2 local medical practitioners. Overwhelmingly, as before, the cohort was fundamentally a rural working class one. As a separate group, there were 29 men who came from what I have described as the ‘family farm’. These are highlighted in the table. As has been pointed out, the description is somewhat arbitrary. However it is important to identify all those cases where a son who was working on the family farm enlisted. Amongst other considerations, this category will prove very important in terms of the conscription issue. Farmers typically wanted to manage the issue of enlistment on a case by case basis, reflecting the unique nature, responsibilities and needs of their individual family unit. Conscription on the other hand threatened to impose inflexible demands and posed a direct threat to the economic viability of the family farm. Typically the son linked to the family farm was in their late teens or early twenties. Also typically they did not hold any land in their own right. The land was recorded in the relevant rate book in the father’s name. However, there were some cases where the land was recorded in the name of both the father and son. In most cases of family farms, the young men recorded themselves as ‘farmers’. But, again, as the table shows, some described themselves as ‘farm labourers’. Possibly, this reflected the fact that while they assisted on the family farm they also worked for a wage on other properties, presumably to bring in more income for the family.There were many possible arrangements. In the table, the case of the 3 Cook siblings demonstrates Just how complex the arrangements associated with the ‘family farm’ could be. In fact, there were 4 siblings who enlisted: James Cook would enlist in the second half of 1916. According to the rate book, the father – Thomas Anderton Cook – had a small holding at Balook. The oldest 2 of the 4 sons – David Alexander Cook and Henry Cook – were also listed as joint owners of the same property. These 2 siblings were married. The 2 younger siblings were not married. Of the 4 Cook brothers, two described themselves as ‘farmer’, one as ‘farm labourer’ and the fourth as just ‘labourer’. The exact pattern of land holding across the family is unclear because while it appears that there was more than one holding, the rate book only lists one. However what is clear was the fact that when the sons enlisted, responsibility for managing the Cook family farm (or farms) fell to the father and the wives. We know this because in June 1918, Henry Cook was returned from Europe and discharged from the AIF for ‘family reasons’. The family reasons involved the management of the farm(s). Initially, the AIF refused the request, noting that the particular case was not as serious as other ones brought to its attention. It appears that the intervention of local politicians at both state and federal level won the discharge from the AIF. I myself am a farmer at the above address [Balook], my four sons have enlisted, and I am unable to obtain necessary labour to carry on, not only my own farm, but also the farm of the above son mentioned, and his other brothers at the front. I have made careful enquiries re this matter and so far as I am able to ascertain this man’s [Henry Cook] financial position is very poor. He has a small selection of about 100 acres which he has been in possession of for about 12 years, there is little or no stock on the place, and his wife who is in delicate health cannot afford to pay for the necessary labour on the place to keep it in order and the Father is not in a position to help, consequently the place is going back, hence the Father’s reason for applying for his return. Another case worth mentioning involved Robert John Trigg of Alberton West. According to the rate book, he and his brother – Joel William Trigg – had approximately 200 acres at Alberton West. Only Robert enlisted – he died of wounds in December 1917 – and presumably this was a mutually agreed arrangement that left one brother to manage the farm(s). Again, this particular case will be looked at in more detail in the context of the conscription debate because it was another instance where this internal family arrangement between the brothers was potentially threatened by the blanket application of the demands of conscription. What was also interesting about this case was the fact that when he enlisted, the local paper (4/8/15) carried a report that Robert Trigg had … engaged a man to take his place while he is absent in the fighting line. Obviously, lost labour needed to be covered; but there would have been few cases like this where there was funding available to engage someone else. The cases highlight 2 critical issues: the complexity of ‘family farm’ arrangements; and the increasing social and economic impact that the loss of so much labour from the district was having on individual families and the wider community. In the table there are only 2 instances where the description of ‘farmer’ (in his own right) has been used. Both of these relate to cases where it has not been not possible – to this point – to establish the validity or otherwise of the claim. There are also instances where the description ‘farmer/farm labourer’ has been used. There are 13 such cases where even though the enlisted man gave his occupation as ‘farmer’ there is no corroborating evidence to support the claim: there is no link to any family farm, the men are too young or there is nothing in the relevant rate book or electoral roll to prove they were farmers. The more likely situation was that they worked as farm labourers. As with the previous cohorts, to the end of June 1915, the burden of enlistment continued to fall on the rural working class – whose employment was typically itinerant and casual – and a small group of young men coming from family farms. There was also a significant number of immigrant rural workers from the UK who enlisted. The following table gives a breakdown of ages. The next table presents equivalent data for the full period from 1914. It shows a slight shift away from the group of ‘minors’ and the related gradual move to an older cohort of men enlisting. The percentage of those in the 18-25 age band shifts from 73.1% (1914) to 69% (1915-1) to 64.5% (1915-2). The number of men in this cohort who were married prior to enlistment was 23. This represented some 11.5% f the cohort. The equivalent percentage figures for the 2 earlier cohorts were 7.8% (1915-1) and 4.5% (1914). Again, as with age, there is an incremental increase in the number of married men enlisting. The figure of 23 does not include the 7 men who married at some time after enlistment and before embarkation. Nor does it include the 9 cases where men married in the UK. Through to the end of 1915, the volunteers associated with the Shire of Alberton continued to be young and single. Predominantly, they were rural workers and most simply described themselves as ‘labourers’ or ‘farm labourers’. There was also a group of young men – about 30 in this particular cohort – who came from the ‘family farm’. This group was roughly the same size as the group of immigrant rural workers (29) from the UK who ‘answered the call’. By the end of 1915 there had a very significant reduction – approximately 300 men – in the size of the labour pool across the district. The significance of the enlistment in the AIF of this large number of rural workers would be highlighted in the conscription debates over 1916-17. Conscription threatened to be a blunt instrument that would further compromise the viability of the family farm, and ignore the considerable sacrifices that the local farming community had already made in the interests of the Empire. The reasons why the rural working class were keen to join the AIF and the consequences of this association will continue to be explored in the blog. This entry was posted in July to December 1915, Religion & Community, The rural working class on April 22, 2016 by pcashen. This post looks at the soldiers’ farewells staged in 1915. Over 1915, the local newspaper – Gippsland Standard and Alberton Shire Representative – reported on 30 farewells that covered approximately 60 men. Clearly, there were far more men who enlisted in 1915 than the number who were given farewells. Some men had already left the district and enlisted elsewhere, including interstate. Other men slipped away deliberately, without any sort of farewell. It also seems that there were not many farewells for men who had been working in the district for only a short time. Many of the men who were not given farewells did at least receive the Shire Medallion when it finally became available from October 1915. In such cases it was handed to a relative or friend of the local who had enlisted. Essentially, the data and details in the post come from reports in the local paper. There was a general expectation in the local community that soldiers’ farewells would be reported in the local paper and identifying the individual locals who had volunteered was a community preoccupation. Equally, as will become apparent, the reports of the farewells also served as ongoing chapters in the narrative of the War. Farewells – and later the ‘welcome homes’ – represented the opportunity for local spokespersons to push the essential themes that maintained the local community’s focus on and support for the War. Even if people did not attend the farewell itself – and falling attendance did become a concern – they could read the substance of the speeches in the local paper. As well as looking at what was said at the farewells, the post also considers the question of who the speakers were. While there were sometimes gaps in the information from reports of farewells in small townships, the newspaper reports were generally thorough in identifying both who spoke and what was said. The significance of the particular focus on the speakers is that, as already argued, it was the professional, propertied and managerial class of the local community that controlled the narrative of the War. On the other side of this broad equation, it was typically the rural working class that enlisted. Most farewells (22) were held in Yarram as the principal town of the Shire of Alberton. Included in the 1915 farewells in Yarram, there were farewells to 3 high profile members of the local community. In May, Dr Rutter was farewelled when he joined the Australian Medical Corps. In July, Dr Pern, another local doctor, was farewelled when he too joined the AMC. Then in late September the popular local Church of England minister, Rev Geo Cox, was farewelled. Ironically, Drs Pern and Rutter had failed Cox when he had made earlier attempts to enlist. All 3 farewells were conducted as major events in the community: the venues were full to capacity; there was an extensive line-up of speakers; much was made of the history of selfless community service, as either clergyman or doctor, before enlistment; and because all 3 men were married with children, and Cox and Pern were in their forties while Rutter was thirty-five, their individual enlistments were held up as outstanding examples of sacrifice and sense of duty. However, farewells of this scale were not possible for everyone who enlisted. By mid 1915 it was recognised that some sort of committee would have to be formed so that a common, but manageable, format could be put in place. Any farewell, no matter how low-key, involved considerable effort and there needed to be a process that could be sustained. The first committee meeting to tackle the issue of setting up a process for soldiers’ farewells was held on 6 August 1915 and reported in the local paper on 8 August 1915. As reported, there was general agreement at the meeting that the whole business of farewells needed to be better organised. Everyone agreed that it was essential that those locals leaving the district be given a farewell. There was also general agreement that a wristlet watch be given. Later this would be replaced by the Shire of Alberton Medallion. For efficiency those at the meeting wanted the farewells to be organised for groups of men rather than run on an individual basis. But others pointed out how difficult it was to get accurate and timely advice from the AIF on the men’s movement and that it was never going to be possible to achieve the level of planning and organisation that people wanted. The first meeting also tackled the issue of who should receive a farewell. Some wanted to draw a distinction between ‘bona fide’ residents of the district and others who had only been there ’two or three months’ and who ‘did not intend returning’. Overwhelmingly, these would have been the rural workers who found themselves in the district when they decided to enlist. Others thought a six month residency in the district should be the standard. At the meeting, the issue was left unresolved. In a real sense, the rural workers themselves resolved the issue for the committee. Most of the farewells that were organised tended to be for men who had already enlisted and who were home on their final leave before embarkation. On the other hand, the pattern for men who had been working in the district as itinerant rural workers was to complete the medical in Yarram, sign their attestation forms, be issued with a railway warrant from the Shire Secretary, and in the next day or so, travel to Melbourne to complete the enlistment process. Once in Melbourne, these men did not return to the Shire and so the issue of any farewell did not even arise. Interestingly, those at the meeting on 6 August, were quoting the figure of 200 men from the Shire who had already left, but formal farewells would have covered less than half this number. Most commonly, the discrepancy involved the rural workers. The meeting held on Friday 6th inst., in the shire hall, having passed a resolution which would not provide adequate funds for farewells and welcomes to soldiers, a further meeting was called for Friday last [13/8/15]. Curious to state, but half-a-dozen attended, too few for business, and the movement which promised well at the outset has fizzled out. Surely our boys are worth some little attention! Those gentlemen who came forward with “fivers” seem to have blown out the five shillings project. It was another example of the petty politics that could so easily undermine local projects. From that point, the compromise was that any level of donation was accepted, and the paper regularly published the amounts which ranged from 2/6 to £5. The actual farewell ceremony that developed over 1915 was simple. It was held in the shire hall. The timing varied and had to fit in with train times from Alberton. There would be one or two speeches, a toast to the soldier’s health, the soldier would generally reply and there would be a verse of the National Anthem or some other patriotic song. “For he’s a jolly good fellow” was also usually sung. Once the Shire Medallion and Card became available, their presentation added a sense of formality to the occasion. After the brief ceremony, someone would volunteer to drive the soldier to the train station at Alberton. The name of the person offering the car would often be published in the paper. Not much changed over 1915. The committee did request advance notice about soldiers’ leave from the military authorities but, not surprisingly, such a concern was not a priority for the AIF. Late in the year, the committee erected a flag pole outside the shire hall and when a farewell ceremony was to be held the flag would be flown to alert townspeople. This action was in response to poor attendance at the farewells. Initially people put the low numbers down to the lack of notice being given for farewells but, over time, the claim that people were not prepared to put themselves out was raised repeatedly in the local paper. The suggestion made by Wliiam Geo. Pope at a farewell reported on 29/10/15 – he served on the Soldiers’ Farewell and Welcome Committee – that the local clergy should set up a roster so that there was always one of their number at every farewell was another not very subtle claim that the soldiers’ farewells were not receiving the attention they warranted. The old idea that one volunteer was worth two pressed men did not count these times. It was obviously easier to cover the farewells held in Yarram than those held in outlying locations. Such farewells usually required a local ‘correspondent’ to write about the occasion. In a couple of cases – Wonyip and Blackwarry – the report was short on details. Over 1915, there were 8 farewells conducted in smaller townships or settlements: Blackwarry (1), Kjergaard (2), Womerah (1), Gunyah (1), Alberton (1), Woodside (1), Wonyip (1). Obviously these lay outside the influence of the committee in Yarram, although there was the odd occasion when a committee member from Yarram would attend. As noted before, farewells in the townships and settlements of the Shire of Alberton tended to be on a grander scale than those held in Yarram. Generally, they were held at night and they involved a social and dance in the local hall. They were attended by most if not all the local residents. They were far more of a community celebration. The themes covered by the speakers were the same as those in Yarram, but there were more speeches and more patriotic songs. Also, there was always a special gift – silver mounted wallet, inscribed gold medal, silver mounted pipe, pocket wallet, purse of sovereigns – and this was given in addition to the Shire Medallion. It is possible to analyse the speeches, as reported in the local press, and identify several common themes. Inevitably, the team of speakers at these events would hear each other’s speeches – or read them in the press – and over time a common approach to the themes, the imagery, the stories and even the slogans developed. For the committee managing the farewells, the men being farewelled had to leave with a strong sense of community support and the conviction that their decision to volunteer was absolutely correct. They had the right to be proud of what they done. As well, the audience at the farewells wanted to be there. They wanted to show their respect, and they believed in and supported what they heard. Overall, the scene was set for forceful speech making, with plenty of flourish and hyperbole. Note: In the following description, the dates quoted refer to the date the report of the farewell appeared in the local paper. The date of the actual farewell would have been within one week or less of the date of publication. This was by far the most common theme. Every farewell praised the moral quality or character of the person volunteering. The act of volunteering was proof of character. Dr Pern had placed the price of patriotism on one the side of the scale, and personal considerations on the other, and patriotism had gone down flop and won. (Applause). The speakers inevitably drew attention to the fine character of the volunteers as young men or boys before they enlisted. Dr Pern was referred to as having … a gentlemanly character and genial nature (9/7/15). G F Sauer was reported (15/10/15) as saying Pte O J Parrott was … a clean living man, and he felt sure he would be a clean fighter. G F Sauer (20/10/15) also farewelled 2 other young men noting that they … had led clean lives, and were a credit to the district. E L Grano referred to the same young men as having been good citizens and he was sure they would … do their duty faithfully. Some of the speakers had known the men since they were boys. At a farewell from Woodside for Pte Richard Starling (17/11/15), one of the speakers, J W Condon, said of Starling, Even when little more than a boy he had been a leader. He had led men older than himself, and had always led them in the right way. At the farewell for Pte Gordon S Jeffs (13/10/15), Cr Barlow spoke of how he had known the young man from birth and Mr V S Lalor added that Gordon was … the worthy son of a worthy father. At a farewell at Womerah (4/8/15) one speaker went so far as to relate that, as a youth, one of the men being farewelled, … never sat down to a meal without saying grace. At his farewell in June 1915 (16/6/15), Pte R O’Dea was referred to as a ‘manly man’. On the sub-theme of the ‘manly man’, Appendix 1 features the poem, Then You’re a Man by Lyde [sic] Howard. It was read in full by F C Grano at a farewell in late October 1915 (29/10/15). The verse – overdone, even by the standards of the time – is strong on Christian imagery, including the eternal reward in heaven, which featured commonly at the time. Fellow clergyman, Rev Tamagno (Methodist), at the farewell for Rev Cox (29/9/15), was at pains to express his admiration for Cox’s sense of duty. He described Cox as a true ‘white man’. He went so far as to claim, … there is no whiter man in this town and outside it, and these words are not flattery. Cox, for his patriotic effort, had been raised to some exalted level of manliness in the British Empire. The daring deeds of our men by scaling the heights of Gallipoli in the face of tremendous fire had opened the eyes of the world. They had covered themselves with glory, and sent a blaze of fame from one end of Australia to the other. This particular theme tended to be represented in an indirect and understated form. It was always there as an assumed reality. ‘Duty’ for example was often described as ‘duty to the Empire’. Men were said (14/5/15) to volunteer for ‘service on behalf of the Empire’. Dr Pern ( 9/7/15) was said to be leaving to serve ‘King and Country’. Look at the murderers of mothers and children, and at the case of an English nurse who had been attending her wounded. When there was such a cold-blooded enemy to deal with he would give them no quarter; they were out to win by fair or foul means, and he would be out to do the same. Britain had been too lenient with the Germans for many years, and now their brave boys had to pay for it. At his own farewell (6/10/15) Rev Cox spoke about the need to prevent the Germans ever landing in Australia to commit the atrocities carried out in Belgium. He admired the young man for making the personal sacrifice in going to fight for the Empire, but perhaps more to be admired was the worthy mother, who placed no objection in her son’s path of duty. Only mothers knew what it was to lose their sons. A doctor’s wife knew full well the dangers of war, and Mrs. Pern would spend many an anxious hour while her husband was away. The table below gives a brief breakdown of the men who made speeches at farewells in 1915. It gives the names of the men, the number of speeches made and their occupation, taken from the 1915 Electoral Register. Additional information on the individual’s background, from the local newspaper or some other source, such as the Rate Book, has been included. As indicated, most of the farewells took place in Yarram but the table also shows those cases where the speech was made at a farewell in some other location in the Shire. The group is exclusively male. War was essentially men’s business. The mother or wife sacrificed the son or spouse to the fighting and, as indicated, this was a common theme at farewells, but women played no role in, as it were, the management of the War. Women’s efforts in the local community were restricted to ‘relief’ work in organisations such as the Red Cross. In a sense, their involvement matched that of their place in the local churches where their role was to support the clergyman. The limited role was part of the wider reality of gender-based politics – women, for example, were not local councillors nor justices of the peace. In terms of the speeches at Yarram it is clear that a relatively small group of local professionals, proprietors and managers dominated.There were some local farmers but these men were tied closely to the politics of the town and district. They occupied civic positions, and exercised power, as local councillors and/or justices of the peace. Moreover, they were successful and established land holders – for example, Arthur H Moore was arguably the largest and most successful grazier in the entire Shire of Alberton. Outside Yarram when farewells were organised, the range of speakers tended to reflect local conditions. Obviously, farmers tended to dominate but the dynamics of the local community could also play a part. For example, at Woodside when 2 men were farewelled in November 1915 the focus was on their membership of the ANA and on that occasion the speakers were drawn from locals – labourer, barman and blacksmith – who worked in the township. Looking at the profile of those making the speeches at soldiers’ farewells is only part of the story of how the narrative of the War was represented and controlled in the local community. There were other key groups involved – for example, the various iterations of the local recruiting committee. Moreover, the process itself was inherently dynamic and, in fact, characterised by many tensions. For example, the last post pointed to the criticism levelled at the local council for not according Empire Day in 1915 the recognition it deserved. As we will continue to see, the local politics round support for the War could be fractious, divisive and even bitter. However, it was clear that in 1915 control over the ‘official’ narrative of the War in the Shire of Alberton lay in the hands of the professional, managerial, proprietorial and propertied class centred on Yarram. This group presented the narrative from the pulpits of the Protestant churches, at public celebrations (Empire Day) and other functions (recruiting meetings), in the local state schools, in the pages of the local press, and at the farewells for soldiers staged at regular intervals. Sergeant Johnson thanked them for the kind words uttered, and remarked that he felt he had the best wishes of all in Yarram and district. He was confident that all who were going away to fight would keep up the honour of Gippsland. Sgt Cyril Johnson was killed in action on 14 May 1918. The path of comfort, and the friends who cheer? Laboured and sweated at from year to year? And will you bid farewell to wife and kindred? Keeping up steadfastly as best you can? Then you fulfil the calling of a Briton. Than that which calls you to your country’s need? That there are deadlier wounds than those which bleed? The sacrifice of every other plan? The you fulfil the calling of a Briton. Go forth to fight; stamp out crime and sin. The heaven, and all Eternity shall bless you. This entry was posted in January to June 1915, July to December 1915, Recruiting, Religion & Community, The narrative of the War, The role of the Press, The rural working class on February 18, 2016 by pcashen. This post continues the analysis of Post 22: Enlistments to the end of 1914: background characteristics Part 1 – movement, occupation, age and marital status, in that it examines the same characteristics, and employs the same approach, for the group of 104 men who enlisted in the first half of 1915. The specific characteristics covered in the attached table are: the place of birth, the place of enlistment, the address of the next-of-kin at the time of enlistment, the address of the individual volunteer at the time of enlistment, the occupation at the time of enlistment, and age and marital status at the time of enlistment. As for Post 22, most information in the table is taken from 2 key sources. Place of birth and place of enlistment are taken from the enlistment papers in each individual’s AIF service file. The other pieces of information are taken from the Embarkation Roll. However, for ‘occupation’, the evidence covers not just the Embarkation Roll and the individual AIF service file but also the Shire of Alberton Rate Book and the Commonwealth Electoral Roll for the Subdivision of Yarram Yarram. This extended range of evidence is needed to identify those men who were from the ‘family farm’. As is shown in the table, in one or two cases, a young man described himself as a ‘labourer’ when in fact his father was a farmer in the Shire and the young man was, presumably, working on the family farm. Also, there were cases where the young man described himself as ‘farmer’ when the evidence – principally from the rate book – indicates that he was working for his father on the family farm. Consequently, in the table below, the description of ‘family farm’ – highlighted – covers all situations (12) where the son was, most likely, working on the family farm. There was also the situation where a young man described himself as a ‘farmer’ when all the evidence points to him being a ‘farm labourer’. In the table, this is most evident with immigrant farm workers: they were relatively young; had been in the district only a short period of time; there is no record in the local rate book of land in their name; and where they do appear on the electoral roll they are not described as ‘farmer’. As for Post 22, the table covering the first half of 1915 highlights movement as a key characteristic of this group. Again continuing the analysis from Post 22, it is possible to identify 4 broad groups. First, there are what can be termed long-term residents: those who were born in the Shire, enlisted in Yarram – and were working in the local area at the time of enlistment – and gave a location in the Shire as their own address and that of their parents. This was the largest single group and, not surprisingly, individuals from this group were most likely to be included on the Shire of Alberton Honor Roll and, in the case of those who died on active service, the Shire of Alberton War Memorial. One minor qualification to make with this group of volunteers is that increasingly the men were formally being enlisted in Melbourne. This was the case even where they had their (first) medical, completed the enlistment paper work, took the oath and were issued with their railway warrant in Yarram. In part, this arrangement reflected the concern that country doctors were too inclined to pass volunteers as fit. It appears that by the end of June 1915, all men were medically ‘re-examined’ in Melbourne. The second group involved those who had been in the Shire for some time – they had been born in the Shire and/or spent time there as a child or adolescent – but who, by the time of enlistment, had moved out of the Shire. As before, whether or not they were included on the Shire of Alberton Honor Roll – and, if relevant, the Shire of Alberton War Memorial – appeared to be tied to the presence of some ongoing family link to the Shire. There needed to be immediate family members or relatives working to keep the individual soldier’s memory alive in the local community. Generally, those in this second group only featured on local school honor rolls. However, the individuals concerned were often well known – or more correctly ‘well-remembered’ – in the local community. For example, Bertram Atkinson only appears in the table because he attended Yarram State School as a child. His name appears on the school’s honor roll. He was 26yo and married when he enlisted, and his wife was living in Hawthorn. He had even attended Malvern East Grammar some time after leaving the state school at Yarram. Clearly, his link with the local area had finished many years before he enlisted. Yet because he was the son of the Church of England minister based at Yarram at the turn of the 20C – the Rev. James C Atkinson – locals definitely remembered him. In fact, there were several articles in the local paper reporting his death (21/9/15) and describing his family’s association with the district. The third group takes in those who came into the Shire and had established themselves as local by the time of enlistment. The largest group here were the immigrant workers from the United Kingdom. There were 19 in this group. Added to the 15 from the group who had already enlisted by the end of 1914, the total number of UK immigrant workers to enlist to the end of June 1915 becomes 34. Doubtless there would have been a high expectation in the local community that these young men from the ‘Mother Country’ should enlist. Another example from this group of people who had come into the Shire and established themselves as local, was the local medical practitioner Dr John Hemphill Rutter. There was extensive reporting in the local paper of his farewell and then his service overseas. He returned to Australia at the end of 1916. The last group was made up of those who had moved into the Shire, but only recently, and in some cases it might well have been that they enlisted in Yarram because that was where they found themselves just at that point in time. Had their work, or search for work, taken them to Foster or Sale they would have enlisted there. But as transient as their work was, the fact is that they enlisted in Yarram. As pointed out in Post 22, the creation of these 4 groups is arbitrary: an attempt to impose some sort of order on what was a highly complex pattern of movement. Inconsistencies and anomalies across the table suggest that the boundaries between the groups were not as fixed as the model suggests. However, it is clear that the movement of this group, over what was typically not much more than 20 years of life, was a distinguishing feature. Such movement is also evident in the number of the group who were born interstate – 8 – and the number who enlisted interstate: 7. Moreover, there is only one person common to these 2 sub-groups. It even appears that one of the 104 men – Roy Liddelow – enlisted in New Zealand. All of this data questions the local historian’s natural tendency to try to tie people’s lives to a specific geographic location. ‘Local’ in the context of early 20C Australian History is a highly problematic concept. Obviously the high incidence of movement is tied inextricably to occupation. By far the largest single group (50) was made up of ‘ labourer’ or ‘farm labourer’. As well, there was the typical range of rural working-class occupations. Within this solid rural working-class cohort, there were some men in semi and skilled trades, and there was a small group of young men in clerical positions. However, as with the previous group – the one to the end of 1914 – the number of professionals and higher level administrative and managerial positions is very limited. Overwhelmingly, in the Shire of Alberton, in the period we have looked at so far – from the start of the War to the end of June 1915 – the typical volunteer was a member of the rural working-class and, most commonly, he simply gave his occupation as ‘labourer’. In this particular group, it appears that there were 11 cases where a son who was working on the family farm enlisted. The cases are highlighted in the table. As noted, this included some young men who described themselves as ‘farmer’ – but there was no evidence of them holding any property in their own right – as well as some who had described themselves as ‘farm labourer’, when in fact the evidence suggested they were working on the family farm and their labour contributed to the overall success of the farm. However, it is possible with this latter group that the son was actually working as a ‘farm labourer’ on a neighbouring farm. Such work provided additional family income. So, conceivably, the number of family farms might be overstated in the table. The more important point is that the number of volunteers who were independent farmers – the farm was in their name, and they were working and managing the farm in their own right – was very low. In fact, from this group of 102 volunteers, if you discount the 2 men from outside the Shire who claimed to be farmers (Ferres, H D G and Kiellerup, G R) there does not appear to have been a single case where an independent farmer or grazier from the Shire enlisted. The case has already been made in Post 22 that there was very little possibility that a farmer would – or even could – simply leave the farm and enlist. Overall, to the end of June 1915, the burden of enlistment continued to fall on the rural working class – whose employment was typically itinerant and casual – and a small group of young men – they were in their late teens or early twenties – coming from family farms. There was also a significant number of immigrant rural workers from the UK who enlisted. The complex questions surrounding this pattern of enlistment – was enlistment driven fundamentally by economic forces ; why did patriotic duty fall so heavily on the working class; were rural workers searching for an identity and status in the AIF that they could never attain in the life style of the itinerant, rural worker? – will continue to be explored in the blog. As before, the expectation continued to be that only single men would enlist. This is evident in this particular cohort, where only 8 of the 102 men were married. The table below has been developed from 2 sources of evidence from the archives of the Shire of Alberton. The first is a list of 128 ‘Recruits Rejected by the Local Doctors’ and the second a bundled collection of enlistment papers (38) of men who had failed the medical. The latter set of files runs from September 1914 to July 1915. There are gaps and inconsistencies with these 2 sources, but they provide some critical insights on the men who failed the medical examination in Yarram, particularly in the period to the end of 1915. In the table, the specific period covered is the first half of 1915. The table shows that at least 18 men who presented themselves for enlistment at Yarram in the first half of 1915 were rejected by the local doctors. In most instances, the local doctors simply recorded that the men failed the medical but in other cases there was some basic reason given. As for all other enlistments, the socio-economic profile of the men was typically rural working class. There was also the typically high number of immigrant farm workers in the group: nearly half the group had been born in the UK. . The table shows the high number of men who made subsequent attempts to enlist, and also the number who, in fact, did enlist (9), in many cases without revealing that they had been previously rejected. Samuel Henry Young failed his first medical (Yarram) but then passed his second one (Nagambie) within the first half of 1915. He was definitely a local as his name appeared on the electoral roll as a ‘sleeper hewer’ of Mullundung. He appears to be the classic case of someone who left the district to enlist elsewhere. Many local men were determined to enlist and an initial rejection was not taken as final. As for the first group of volunteers to the end of 1914, the preceding analysis of the second group – to the end of June 1915 – reveals that it was overwhelmingly the young, single, rural workers – most commonly described as ‘labourer’ or ‘farm labourer’ – who answered the call to enlist. Of the the total number of some 240 volunteers from August 1914 to the end of June 1915, there was a group of young men – about 30 – who came from the ‘family farm’. This group was roughly the same size as the group of immigrant rural workers ( 34) from the UK who ‘answered the call’. Archive One, File Number 703B, Recruiting & Enlisted Men, Box 398. Included in this collection was a tied bundle of enlistment papers that covered men medically rejected. Box 379, “Correspondence etc of Recruiting Committee, Formed April 26th 1917”. Contains an undated and unsigned list headed, “Recruits Rejected by Local Doctors”. This entry was posted in January to June 1915, Religion & Community, The rural working class on December 23, 2015 by pcashen. 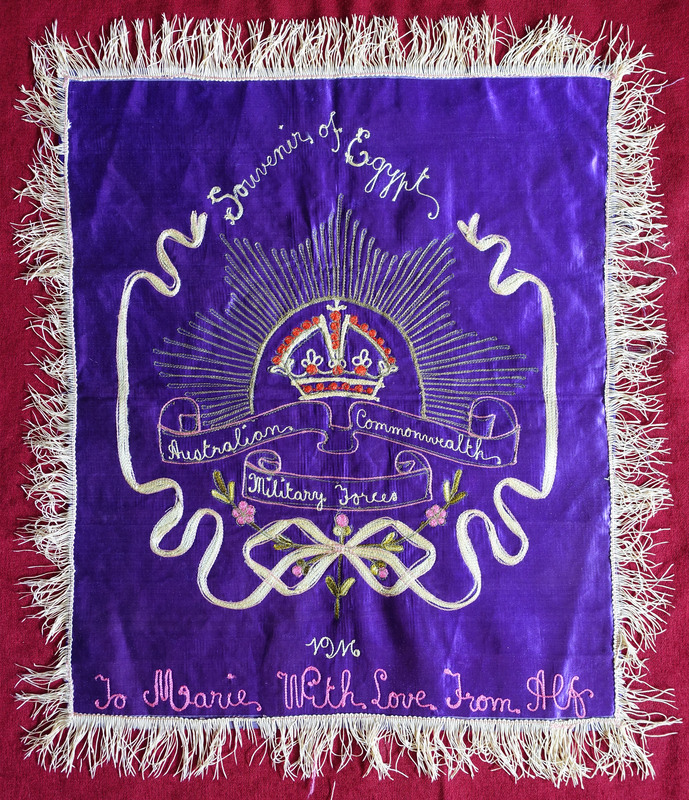 Typical souvenir sent home from Egypt, 1916. Prior to 25 April 1915, the AIF was an army in search of an image. The basics of the image were there from the start and the AIF was created to be a national (Australian) army within the greater (British) Imperial army. The name – Australian Imperial Force – succinctly defined the basic building blocks for the image. All the volunteers for the AIF enlisted as British subjects. Many of its early officers were British. Organisation, training, equipment, weaponry – all matched the British standard. All essential components were designed so that the AIF could function effectively as a module of the British Army. In its infancy, the AIF was not capable of acting as an independent military force and relied, for example, on British intelligence and artillery. At the same time, the AIF was a national army. It was the first, genuinely national military force that the new Commonwealth of Australia had created. While it was created to demonstrate Australia’s total commitment to Britain and the Empire, it still had to reflect a distinctively Australian character. The 20,000 men who landed in Egypt from late 1914 represented the first, large-scale collection of Australian soldiery on the world stage, and it was inevitable that those back home, the soldiers in Egypt, and the rest of the world would try to define this new army in ways that made it unique. The quest was on to define its distinctive national character and explain how it differed from the British Army, and also other Dominion forces, particularly the Canadians and New Zealanders. The struggle to define the essential character of the AIF began as soon as it was formed and continued throughout the War and in the years after the War. Indeed, it is still a concern today, principally because it has always been argued that the character of the AIF goes to the core of what defines Australia as a nation. One of the most important commentators on the early AIF was the official war correspondent Charles Edwin Woodrow Bean. Bean’s own life matched in many way the pursuit of the distinctly Australian (male) character. Born in Australia, Bean was an avowed Imperialist and spent many years at school and university (Oxford) in England; but, once back home in Australia, he became committed to identifying the distinctly Australian national type, and like so many others he was drawn to the itinerant, rural worker. It is a study to see the Australian from beyond the wheat belt with his weather beaten brown wrinkled old face and his rather ill fitting khaki suit sitting at a table in a big grill room amidst over-gorgeous columns and salmon coloured upholstery, surrounded by wealthy Turkish merchants, Italian students, French and Syrian clerks and smartly dressed women, and drinking his coffee or whisky with his mate and waited on by a tall Berber blackfellow in enormous red Turkish pantaloons and wreathed with twice as much gold lace as a field marshall. Bean captures what he sees as the essential image: the tough, hardened, no-pretence Australian soldier and his mate might appear out-of-place but, in fact, the whole scene revolves round them. However it is all rather simplistic, and for all his efforts to make the connection between the rural working class and the newly formed AIF, Bean must have appreciated that the lifestyle of the rural, working-class male was not ideally matched to the world of military discipline. In fact, all was not well in Egypt at that time with the AIF. The Australians were forging a reputation for drunkenness, debauchery and hooliganism and their lack of regard for military discipline was an ongoing concern for their commanders. For a more detailed account of Australian ‘high jinks’ at the time see Stanley (2010) and in particular his account of the ‘Battle of Wazza’ on Good Friday , 2 April 1915 when Australian and New Zealand troops attacked the brothel district of Cairo. Lastly, Cairo has itself a name in the world as a hotbed of both gonorrhea and syphilis. There is a reason for this. Egypt is not a country under the full control of its government. The Egyptian officials even though they had able British administrators to help them have possessed little control over the foreigners who live here. Egypt has been one of those countries which European nations have only admitted to their circle as probationers, as it were. …The consequence is that although Cairo has long been a resort of foreign women riddled with diseases it has been almost impossible to check this disease. Egypt has been an ancient home of syphilis – it was certainly here in Roman times; and there is found in the skull bones of mummies a disease which is almost certainly syphilis. Modern Cairo with its mixture of women from all nations, East and West has long been noted for particularly virulent forms of disease. Almost every village contains syphilis. And if a man will not steer altogether clear of the risk by exercising a little restraint, his only sane course is to provide himself with certain prophylactics beforehand to lessen the chance of disastrous results. There is only a small percentage – possibly one or two per cent – in the force which is really responsible for the occurrences about which Cairo is beginning to talk; the great majority of the men are keen, intelligent, well restrained young Australians, whom you will meet enjoying their hours of leave in front of the cafes or in the museum or the zoological gardens or the post card shops, dressed as neatly as any of the other soldiers in the town, and behaving themselves in the way in which any rational Australian on a holiday would behave. They have the material in them not merely for as good a force as the New Zealanders or the Territorials, but, to one’s own thinking, of a better force, because the Australians here, besides having the best physique, are, man for man, more highly strung, and, if anything, quicker witted. But there is in the Australian ranks a proportion of men who are uncontrolled, slovenly, and in some cases – what few Australians can be accused of being – dirty. In a certain number of cases it is noticeable that these men are wearing the South African ribbon. Possibly they are the men who since returning from that war, have never had any skilled occupation, and who therefore were the first to enlist when recruiting for the present force was begun; or it may be that the discipline in the South African campaign was very much slacker than that required of troops before they will be permitted to go to the front in the present class of warfare. Or it may be merely that a certain class of old soldier is given to the very childish habit of showing off before the young soldier, and giving him examples of the sort of thing that he thinks may with impunity be done by anyone who knows the ropes. Whatever the reason it has been noticed by too many people to admit of doubt that whilst many of the most capable and splendid members of the force are men with South African experience, there is a class of old soldier who, so far from being the most suitable member of the force, is the least suitable of any. Many young soldiers take these men at their true worth. “It’s the likes of them that are going to spoil the game for the rest of us and lose us our leave,” I heard one youngster say a few days since. “The fellows are getting a bit fed up with them down amongst our lot.” But they are really doing a very much more serious thing than losing other soldiers their leave – they are losing Australia her good name in the outside world, and those Australians who happen to be living in Cairo or are in touch with the world outside the camps have the mortification of looking on whilst day by day the reputation of Australia slowly vanishes before the actions of a handful of rowdies who do not really represent the country. The Territorials have not our physique, and some of the Lancashire regiments seem to be composed largely of mere children; but by dint of hard work they have become thoroughly smart soldiers; and although both amongst them and the New Zealanders there has been a certain amount of the hard living which will always be found where great numbers of men are collected, none who is not deaf can hide from himself the fact that the talk at present current in Cairo attaches to the Australian force rather than to the Territorials, or as far as I can judge to the New Zealanders. One does not want to give the impression that things have reached the stage of a scandal or anything approaching it. Steps will doubtless be taken to correct it, as they have been taken before, and the Australian force will be doing itself credit before it has finished its training, and be worthy of the majority of men comprised in it. The New Zealanders have just taken steps to get rid of a certain number of men who were doing little good in their force, and the same, or some similar steps, will no doubt be taken with the Australians. But it is just as well that the Australian public should be aware of the reason for the return of the majority of the men who are returning, or have returned, since the expedition sailed. It is easy for a man to return to his native village and reap a certain amount of hero worship on the ground that he was invalided, or to pitch a story before an admiring crowd at the local hotel of how he was going to show them that he was not going to stand any nonsense, and finally “pitched in” his resignation. The facts are that a certain number of men have been invalided through serious sickness or accident, neither of which was their own fault. A certain number also were sent back some time ago from Albany and Colombo, because some of them – no doubt on conscientious grounds or for reason best known to themselves – refused to be vaccinated. A few others have been, and will be, sent back because they contracted certain diseases, by which, after all the trouble of months of training and of the sea voyage, they have unfitted themselves to do the work for which they enlisted. And a percentage will probably find their way back from here, the reason for whose return has been that they have damaged their country’s reputation, and a few of them have been got rid of as the best means of preserving it. The tone of the piece is cautious and hesitant and the language is qualified, indirect and oblique, if not obtuse. You had to read into it, for example, that men were being sent back to Australia because they had contracted VD (certain diseases). In the context of Egypt and the the triumphalism of the White Australia Policy, references to Australians being ‘dirty’ would have had all sorts of offensive associations. The attempt to pin responsibility on the veterans of the Boer War was bound to win enemies but, presumably, it was preferable to target this specific group of older men than suggest there was a problem right across the force. You can sense Bean’s wariness in writing the piece; and the article was, potentially, a career-ending move for him. In fact, his reputation with the troops was severely damaged and it was only his bravery in the subsequent action at Gallipoli – he was recommended for the Military Cross and mentioned in despatches for his work with wounded men – that restored his standing. Of course, in a body of men like we have here, there are sure to be a few who go over the odds, but it is a very poor percentage, and even these few have not done anything very dreadful. It seems hard that all we Australians should be termed a disgrace to the Empire and Australia by an animal wearing the stars of a captain who has not got the nous of a mule. But enough of this. I think the people of Australia will treat these articles with the contempt they deserve. The barely concealed rage evident in the letter home from Athol Woods points to just how sensitive the whole issue of the AIF’s image was. Everyone – the troops in Egypt, their officers and all those back home in Australia – knew how critically important the image of the AIF was to the image of the nation as a whole. Prior to Gallipoli, the fear that the AIF was creating the wrong image weighed heavily on people’s minds. And Bean had come to understand that using the Australian press to hammer home lessons to the troops on how they should behave was not going to work. The ‘Souvenir of Egypt’ is held by the Cashen family. It was sent to Marie Ziesing from Alfred Carr – both of Mile End, SA – in 1916. This entry was posted in January to June 1915, The AIF, The role of the Press, The rural working class on May 14, 2015 by pcashen.